Three-time NAACP-nominated actor, author and MTV award-winning choreographer Darrin D. Henson is seen in the latest BET mini-series, The Family Business. The multi-talented Henson plays Orlando Duncan, son of family patriarch L.C. Duncan (Ernie Hudson). In the series ( based on Carl Weber’s best selling books), L.C. begins to think about retirement and has to decide which of his children should take over the family’s lucrative exotic car dealership. The Duncans live the high life and have made their share of enemies doing so. Under siege from some of the top politicians, mafia and drug cartels in the city, the Duncans will have to stick together or die separately. The drama with the Duncan family is heating up! 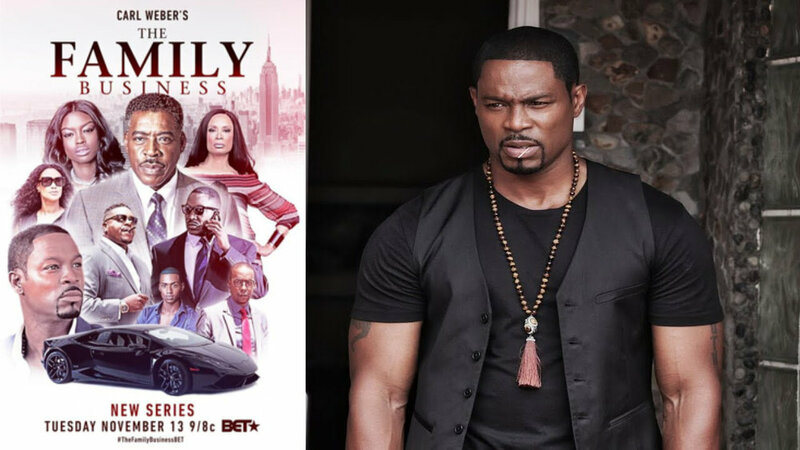 In the winter premiere of Carl Weber's The Family Business, ‘LC Duncan’ (Ernie Hudson) hands over power to son, ‘Orlando Duncan’ (Darren DeWitt Henson), making him the family’s new CEO. Orlando develops a new product that could substantially increase profits for the business, but this operation is carried out at the displeasure of the family matriarch, ‘Chippy’ Duncan (Valarie Pettiford). More money comes with more problems, and Orlando’s highly lucrative venture makes the family a target, putting old foes, The Zuniga’s (Emilio Rivera and Yadi Valerio Rivera), and new rivals (played by Malik Yoba, WWE's Mark Henry) on the offensive against the Duncan family. Can they evade a war with these rival factions or will the onslaught tear them apart? ‘London’ (Tami Roman) also finds herself in a jam when she finds out she’s pregnant, but isn’t certain who the father is. Henson (The Express, Tekken, Stomp the Yard, LincolnHeights, Soul Food, etc.) has the ability to comfortably slip into a role as if he’s lived there before. The actor understands Orlando Duncan’s virtues and flaws and creatively draws you in, as they unfold throughout the episodes. You may love or hate Orlando Duncan, but Henson will make sure you know the soul of the man. Darrin Henson brings an intensity that his fans have come to expect and he never lets them down. Carl Weber is the New York Times bestselling author of titles such as The Preacher's Son, So You Call Yourself a Man, Something on the Side, Up to No Good, Big Girls Do Cry, Torn Between Two Lovers, and She Ain't the One. He is the Publisher and Editorial Director of Urban Books and CEO of Urban Books Media, which is currently producing films based on several of his bestselling novels. I spoke with the multi-talented Darrin Dewitt Henson via satellite form Los Angeles about his multi-faceted career and what he has coming up. he Family Business airs every Tuesday at 9/8c on BET.